Protecting Your Precious 15 Minutes!! 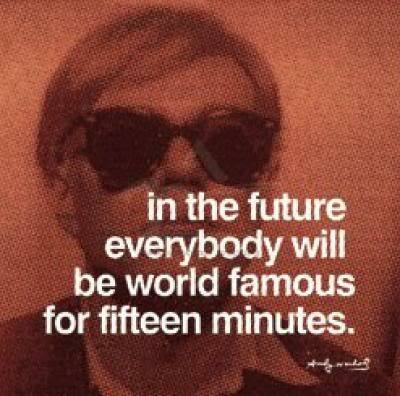 For a bohemian pop art painter Andy Warhol did a good line in quotes. 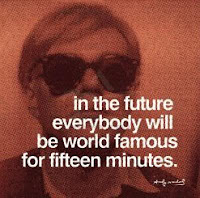 His 'in the future, everyone will be famous for 15 minutes' is a belter. Not strictly true, of course, but great all the same. In Warhol's day fame was a tricky thing - we only had two TV stations, bands that went on for years and cinemas with just two screens. But he knew that fame would soon be as easy as falling off a log. Now we have countless TV programmes, films, magazines and pop bands, and, as all this crap needs to be manned, we have more famous people than ever. In my circle of friends, I know someone who's just won a lottery and a free ticket to Disneyland, a girl who is acting in a bigbudget movie and an other who was featured in a magazine cover. OK, so it's not exactly A-list stuff, but its fame of a kind. And most of us know someone who knows someone that's been on the telly. But how will these people be remembered by the world outside their circle of friends? Having more famous people means having more obituaries (I've been predicting the launch of a dedicated obituary weekly magazine for years. Suggested title: Goodbye! ), so how will these pieces run? I remember ITV – the TV broadcaster in the UK which not prepared to wait until celebs have earned it, just went ahead and started a series called 'After They Were Famous' on the premise that once you've had your fifteen minutes, there'll be little chance of getting another shot. Dave Hill, the famous guitarist from Slade, the once famous English rock band was on the first program, so they did have a point. Consider some more evidence. Has Monica Lewinsky done anything note-worthy since her sexcapades with Bill Clinton? Where's Lalit Modi nowadays? Or sexpot Pamela Anderson, the bumbling Sarah Palin or Britney Spears former husband - Kevin Federline? And by the way, where the hell is Britney Spears? What images spring to mind when you hear the names - Mike Tyson, Tiger Woods, Paris Hilton or Kim Kardashian? They will be remembered for one thing, and one thing only. Or take the case of the current FIFA 2010 World Cup. Robert Green, the English Goal keeper will be remembered lifelong for all the wrong reasons - his 15 minutes of fame and now shame being his unfortunate blunder during the England – US match. I say all this in the light of a major celebrity's dress-busting show last week at an invite only private party that I was witness to. Years of good and perhaps daily workouts, successful motherhood and a happy marriage (forgive me if I stretch things a bit here, but she does looks happy enough) all down the ramp, because she forget to button-up properly. It was all hushed down and all guests including me were requested to keep it....you know private. So, I won’t name her here. But, she may have probably written her obituary - and she may have another forty good years ahead of her - which will include a reference to, and possibly a picture of her munificent assets hanging out on stage. The lesson must be get in there, look good and get out quick. The longer you hang around the more trouble you're going to get in. So folks, look at your history and play it safe. In the future, people may only remember you for your famous fifteen minutes. A lot of thought, practical philosophy and personal anecdote into this post. You are right in saying whatever you have in this post. Nice one. I found myself thinking and thinking while reading many names and lines here. Have a great Sunday, Tariq. Thanks Susan. Fame is indeed fleeting (and fickle too). have a great weekend!